A groundbreaking and comprehensive reference with over 500,000 copies sold since it first debuted in 1970, the new seventh edition of Engineering Mathematics has been thoroughly revised and expanded. An interactive Personal Tutor CD-ROM is included with every book. Providing a broad mathematical survey, this innovative volume covers a full range of topics from the very basic to the advanced. Whether you're an engineer looking for a useful on-the-job reference or want to improve your mathematical skills, or you are a student who needs an in-depth self-study guide, Engineering Mathematics is sure to come in handy time and time again. • Offers a unique programmed approach that takes users through the mathematics in a step-by-step fashion with a wealth of worked examples and exercises. • Contains Quizzes, Learning Outcomes and Can You? Checklists that guide readers through each topic and focus understanding. • Updated throughout for the latest calculators and Excel spreadsheets. •Ideal as reference or a self-learning manual. Extra Bonus! 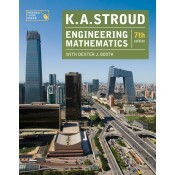 Visit Personal Tutor Online at www.palgrave.com/stroud, the companion website maintained by this book's British publisher, where you'll find hundreds of interactive practice questions and engineering applications questions putting the mathematics in context.